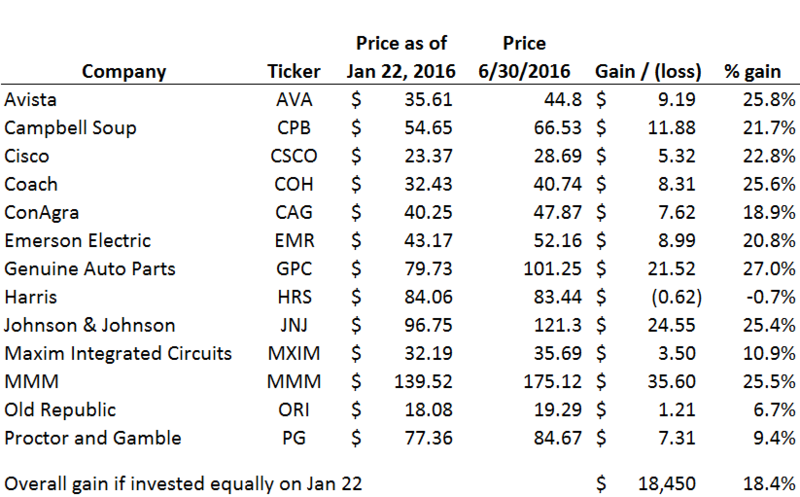 Back in late January when the markets were in turmoil and oil was falling, I recommended 13 stocks with a history of increasing dividends. If you had invested $100,000 equally in these in January, today they would be worth $118,450 for a gain of 18.4%, on top of which you would have collected another 1.7% in dividends for a total return of over 20% in less than 6 months. All while we witnessed a U.S presidential primary circus, numerous terrorist events and the Brits electing out of the euro-zone. While this is a rather extraordinary return and not likely to repeat soon, it does show that you can find value in good quality stocks regardless of the market conditions. I haven’t sold any of these positions, but lightening up on some may be in order, so consult your financial advisor or CPA to get their opinion. On a separate note, I am becoming increasingly concerned with Tesla in light of its planned merger with SolarCity. I do not agree on the synergies between the two and do not like the fact that Elon Musk essentially controls both so I am withdrawing my bullish view on Telsa. Ray Link is a CPA and holds an MBA from the Wharton School. He recently retired from FEI Company (NASDAQ: FEIC) where he was the CFO for 10 years. He is on the on the Board of Directors of FormFactor (NASDAQ: FORM), Electro Scientific Industries (NASDAQ: ESIO) and nLight Inc.
Two months ago my wife and I decided to make the leap to an electric car. Neither of us drive very much, and we were looking for a compact but spacious city car that would be easy to park. I’d been very interested in electric cars for some time (so much so that we had ordered the new Tesla SUV to be delivered in the fall of this year which will become our big commuting vehicle) – but while shopping we came across the new BMWi3. We loved it so much from the minute we saw it that we purchased one that day, and recently logged the 600th mile on the car. Unlike many electrics that are modified from gas engine vehicles, the i3 was engineered as a full plug-in electric. We were still nervous about the potential of being stranded with dead batteries, so we ordered ours with a range extender – a small gasoline motor with a 1.5 gallon tank that turns on to produce electricity if you run out of battery. Theoretically, this gives the car a range of around 120 miles, plus you could continue to stop for fuel to keep going. Fortunately, I think our fears of running dead were overblown. We have never had to use the motor, as the car averages 40 to 60 miles per charge, which is more than we ever go without plugging in. The i3 can be a bit of an acquired taste style-wise – but we love it, as do many people we encounter. It is available in a few wild color combinations, but we chose a more subtle gray, black, with blue trim combo that is unique and elegant. The interior is simple, but incredible. It is dominated by a large screen that tells you everything you want to know about the car, and its entertainment system. BMW wanted to make a totally green car, so most of the materials are recycled. Since there is no transmission or engine, the vehicle is incredibly spacious for its small footprint. With a downloadable App on your smartphone, you can check many of the car’s functions, and set a departure time that will pre-heat the batteries for better performance if it is cold outside. The key fob memorizes the driver’s preferences, so when I get into the car the mirrors, radio station, and other functions are customized to me. It also has a parallel parking feature that allows the vehicle to literally park itself. Driving the i3 was the biggest pleasant surprise. My wife calls it “the golf cart”, because it is so maneuverable and fast to accelerate. You can shoot in and out of traffic, and it fits in the tiniest of spots – though it has plenty of room inside. In fact, we can easily carry several bags of groceries and our yellow lab. You can purchase a special 220 charger that will charge the batteries in a few hours, but we just use the overnight charger that comes with the car, which has worked great for us. You can also download an app that shows all available charging stations, and we were surprised to see how many there are – literally hundreds in Portland, including many at grocery stores and malls – so you can shop and get a quick charge, usually for free. In fact, the other day while looking for parking in a busy neighborhood we found a free spot in on the main street reserved for electrics, with a free fast charging station. Since purchasing the car we have spent less than two dollars on fuel (topping off the small tank), with no negligible increase in our electricity costs. This is an ideal city car – not well suited for long commutes – but if you live less than ten miles from work it could be ideal. I broke my normal rule about avoiding any kind of car financing – and leased the BMW – primarily because I believe the technology will radically improve over the next few years. Also, I think BMW anticipates this concern, and to move cars they have a very good $399 a month lease for a car with a list price of over $50,000. All this just points to the inevitability of more electric cars (see Ray Link’s Tesla article below). The Tesla SUV we look forward to receiving this fall will have a range of over 200 miles per charge, and literally maps out a route with charging stations if you want to take a long trip. To read more about electrics, consult the blog www.theroadelectric.com.